﻿ How Are Optical Transceivers Classified? Optical transceivers can be classified into different categories based on the performance characteristics and nature. The most common characteristics include: transfer rate, transmission distance, fiber mode, wavelength, connector type. This article will have an explanation of the criteria used to classify optical transceivers. Optical transceivers are classified based upon the data transfer rates. The commonly used rates are 10GBASE, 40GBASE, 100GBASE, 1000BASE and 100BASE. The rates mean the speed at which an optical transceiver can transmit data over Ethernet. So 10GBASE refers to 10 Gigabits per second. 40GBASE means 40 Gigabits per second. 100GBASE means 100 Gigibits per second. 1000BASE refers to 1 Gigabit per second, while 100BASE means 100 Megabits per second. According to these rates, fiber optic transceivers have 1000BASE-T SFP, 40G transceiver, 100G transceivers, etc. Optical transceiver cannot transmit data the same distance. For example, a single-mode transceiver is able to transmit distances from 20 km to 120 km, while a multimode transceiver can transmit 2 km to 5 km. Single-mode transceiver supports long distance transmission. Multimode transceiver is generally classified as short reach. By the mode of fiber, there are two types of transceiver: single-mode transceiver and multimode transceiver. Single-mode fiber allows only a single mode of light to couple into the core. This eliminates the modal dispersion issue. Multimode fiber allows multiple modes of light to couple into the fiber. This type of multimode-specific dispersion severely limits the transmission distance achievable over multimode fiber as contrasted with single-mode fiber. Infrared light is used to transmit data over fiber optic networks. The wavelength refers to the measurement of the distance between successive crests in the light wave. Optical transceivers transmit data at one wavelength. The three primary wavelengths are 850 nm, 1310 nm and 1550 nm. Single-mode fiber is optimized for 1310nm and 1550nm wavelengths, while multimode fiber is designed to operate at 850nm and 1300nm wavelengths. Optical transceiver can be classified into different categories based upon the connector types. The mainly used connectors with fiber optic transceivers include LC, SC, ST and MPO. These connector types generally follow a color code system to differentiate between connectors compatible with single-mode and multimode fiber. For example, a MPO connector will be used in QSFP transceivers. When you call for an optical transceiver, these classification criteria will be useful. They will help to select the proper transceiver for your application. If the proper classification is not chosen, the device may fail prematurely and become unreliable. In order to avoid undesirable outcomes, please always be familiar with the classification of optical transceiver. 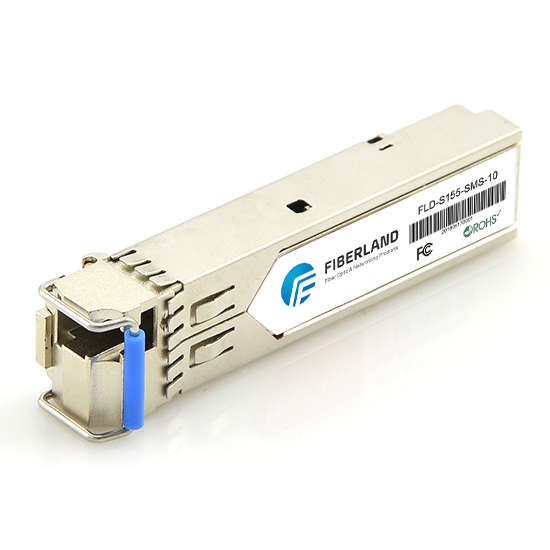 Fiberland has various fiber optic transceivers such as SFP transceiver, copper SFP transceiver, DWDM SFP, CWDM SFP, etc. It is an excellent option for you.